Rebecca McKee ’14, the author of this post, is one of three 2013 recipients of a South Carolina Internship Grant provided by Davidson College and The Jolley Foundation. The purpose of the grant is to allow students to participate in educational internships and to explore living and working in the state of South Carolina. Rebecca will be writing one final post about her SC Aquarium internship in August. Rebecca holds a Juvenile American Alligator for aquarium guest education. The past four weeks working as an education and research intern at the South Carolina Aquarium in Charleston have been some of the most exhilarating days of my life. My weeks here at the aquarium are split between working with the education team and conducting research on the behavioral characteristics of diamondback terrapins with the assistance of the Aquarium’s Sea Turtle Rescue Program. In conjunction with the Davidson College Herpetology Lab and with the South Carolina Aquarium, I am examining the effectiveness of using bycatch reduction devices (BRDs) as a means to reduce the entry of diamondback terrapins. Because drowning in crab traps poses one of the greatest conservation challenges to this species, understanding ways to prevent their entrapment without reducing crab catch is very important to crabbing states like South Carolina. To research this concept, I film a group of 10-15 terrapins as they interact with crab traps without BRDs, with horizontally oriented BRDs, and with vertically oriented BRDs. Through the internship so far, I have recorded over 75 hours of footage on 38 terrapin, and I will analyze the footage later this fall. Because this is my first opportunity to do independent research I am learning quickly about the research process, animal husbandry, and how to troubleshoot problems that arise with the help of the turtle biologists in the Aquarium’s Sea Turtle Hospital, Christi Hughes and Kelly Thorvalson, and with the help of my Davidson College advisors. While I spend the research days quietly observing terrapins as they undergo the same trials in an isolated location underneath the aquarium, my days as an education intern are much more varied. 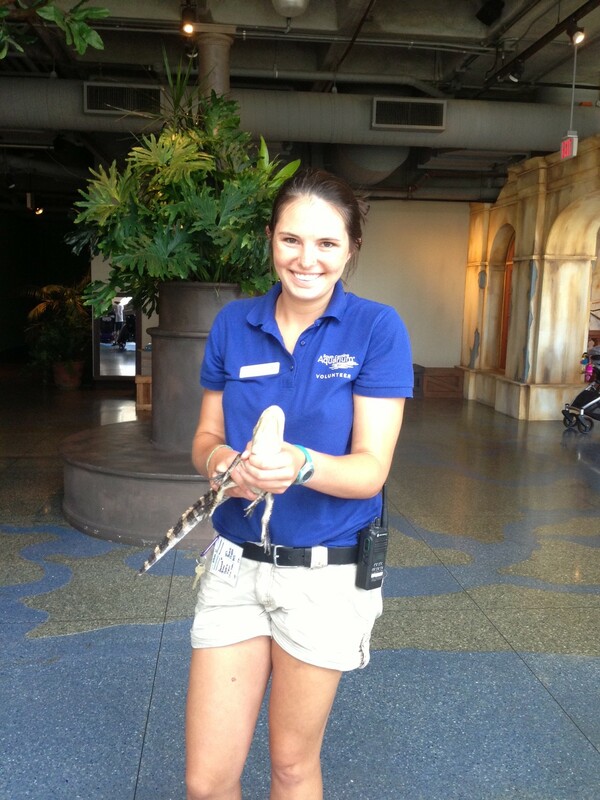 As a member of the education team, I perform educational shows, bring animals like snakes and turtles into the galleries to provide guests with the opportunity to interact closely with the various creatures, give tours of our “behind the scenes” operations at the aquarium, and run info carts featuring interactive games to help kids learn about specific animals or ecological concepts. Because both people and animals are unique and somewhat unpredictable, every day and even every moment of my experience is completely different from the ones before. Although the daily variation in my tasks poses new challenges, it creates an environment of constant learning and growth. Prior to my first day as an intern, I had never stepped foot into the South Carolina Aquarium. Having grown up in the mountains of North Carolina, I felt like I had entered a totally new world. When I listed to my supervisor list off all the tasks and the depth of knowledge of the marine world that would eventually be expected of me as a member of the education team, I could feel my pulse start to race. Within the first couple hours on the floor working the carts and walking around with animals, I found that my excitement to share what I knew with the guests far outweighed my initial apprehension. Seeing kids and their parents’ surprise and interest when I tell them about the special feeding technique we use with our green moray eel or how our eastern king snake, King Louis, is immune to copperhead and rattlesnake venom encourages me to learn things even faster. Even though I perform generally the same shows and give the same tours, the guests will ask different questions, sometimes questions I have never thought to ask. Even with the same basic information delivered, I learn facts I did not know from my coworkers all the time, and constantly hear new ways of explaining the same concepts. So while I might have picked up the general information much more quickly than I thought I would, the dynamic, learning-centered environment the aquarium provides makes every day an educational one for both the guests and the staff. Perhaps even more exciting than seeing guests respond to the interesting information, is seeing their responses to some of the sad realities many of the species in our exhibits face as a result of increasing habitat destruction, pollution, and other threats. When talking about problems like sea turtles consuming plastic bags or owls being struck by cars at night, it is obvious that many people there genuinely care about these issues. They care and want to help. As an environmental science major, I study lots of sad things—extinction, oil spills, droughts, etc. Many problems seem hopeless. When I watch how eagerly kids volunteer solutions like knocking down sandcastles to give baby sea turtles clear path to the ocean or cleaning up litter or slowing down near lakes and wetlands for turtles to cross, I see new hope for struggling species and our environment. People care about what they know about. Through both my work with the terrapins and with the education department, I feel as though I am helping others learn about and appreciate the ecosystems right outside their door or off their docks, and I think that is the main reason I find this job as the education and research intern very rewarding. Searching for Research? You Have Options!